The lab activity was developed by Jeff Lockwood of TERC and Alison Mote of the Ann Richards School for Young Women Leaders for the EarthLabs project. 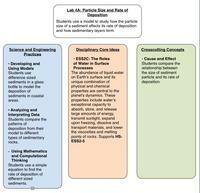 In Part A, Students learn how particle size affects the rate of sediment deposition and how sediment layers form. In Part B, students build a physical model that shows how sediments are deposited at ocean margins during periods of glaciation by icebergs. 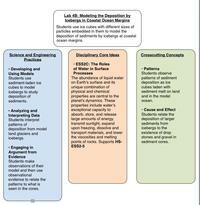 Describe how particle size affects the deposition of sediments. Model how sediments are deposited on ocean margins by icebergs. Describe the processes that combine to produce sequences of sediments on the ocean floor. In Part A: Particle Size and Deposition - Students use a simple model to explore how particles settle out of a solution and how the sedimentation rate is determined. In Part B: Modeling Deposition by Icebergs in Coastal Ocean Margins - Students model the deposition of sediments by icebergs at coastal ocean margins. In Part C: Modeling Erosion and Deposition at Ocean Margins - An Optional Activity or Demonstration - Students model erosion and deposition by constructing a model with three different types of sediment to produce a delta using a mini stream table (paint tray). Time Estimate - 20 minutes if done as a demonstration, 60 minutes if done as a student activity. To download one of the PDF or Word files below, right-click (control-click on a Mac) the link and choose "Save File As" or "Save Link As." Students can work in small groups. 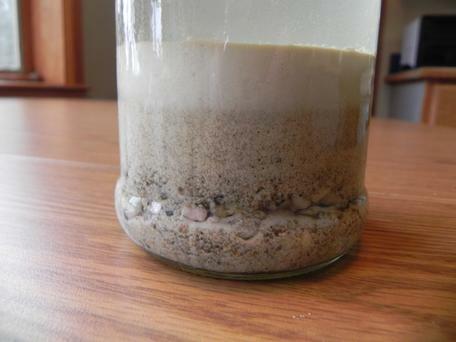 This model of deposition and sedimentation rate is most effective if you use at least three types of sediment: play sand, craft sand, and flour. You can add aquarium gravel to produce a kind of conglomerate layer at the bottom of the bottle. There are two key concepts demonstrated by the model: 1) Sediments settle out by size so at ocean margins you would expect rocks, gravel, and sand to be deposited close to shore, while the fine-grain sediment--silt and clay--should be deposited farther off shore. 2) Students are examining the concept of sedimentation rate. Sedimentation rate is an important indicator of climate change. When an ice sheet is present in a region it causes more erosion on land that drastically increases the rate at which sediments are deposited over time. As mountains rise and glaciers advance, more and more material is eroded as the ice slowly flows downhill to the sea. As mountains grow higher, glaciers erode more land which accelerates erosion rates and leads to and even higher sedimentation rate. A typical student result is shown below. 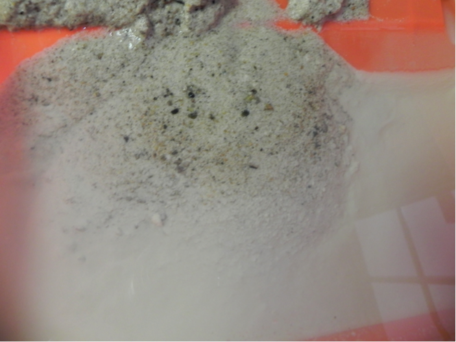 Gravel mixed with play sand, with play sand, craft sand, and flour forming layers in the jar. Note: the layers are somewhat slanted since the jar was moved as the sediments were settling. Have students build their sediment column, shake it up, and then wait until the next class period to engage in a class discussion of the results. The flour can take a few hours to completely settle. Students are building a model that demonstrates how the types of sediment and the amount that is deposited is related to ice age conditions, when ice sheets advance over continental margins. When ice reaches the sea, massive numbers of icebergs calve and, act as sediment delivery systems. Melting icebergs increase the sedimentation rates on the continental shelf, slope, and in deep water. 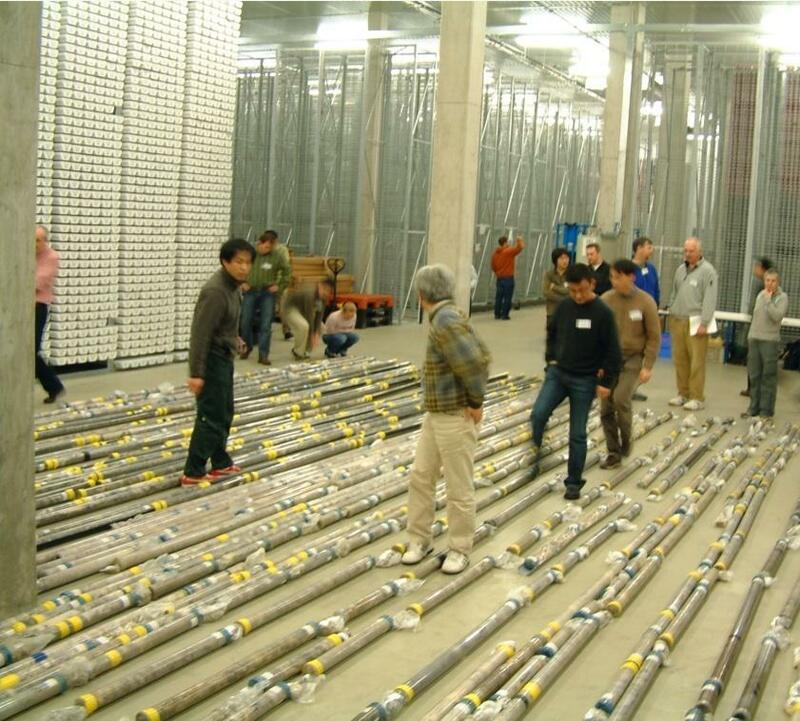 Because sedimentation rates change as the amount of ice changes, scientists can determine the relative nature of the climate (and temperature) by measuring the thickness of the sediments deposited over a certain period of time. So low sedimentation rates indicate a warmer climate since only rivers, streams, blowing dust, and microorganisms were responsible for depositing ocean sediments. High sedimentation rates indicate a cooler climate because a lot of additional sediments were also deposited by melting icebergs. Make the model icebergs in an ice cube tray. 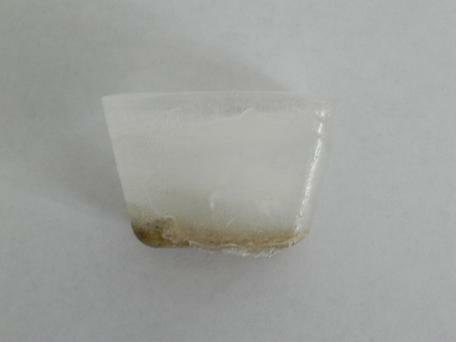 Be careful not to add too much sediment as the ice cubes' density will increase and they will sink! Below is a typical average "iceberg." A brick is easy to use as a stand in for land, but you can use gravel, rocks, or any other object in its place. Have students use several icebergs and have them simulate them calving and floating out to sea. Results are more immediate if you use warm water instead of colder tap water. Point out that using a straw and a few puffs of breath to move them slowly from the shore to the deep ocean is analogous to the action of wind and ocean currents moving the icebergs out to sea. If time allows, you may want to insert this activity so students can compare erosion and deposition as it occurs at ocean margins during non-glacial periods to the deep ocean deposition by icebergs they modeled in Part B. It is essentially a mini-stream table produced by using a paint tray and three types of sediment. An example of the finished product is below. This activity can be done as a teacher demonstration of as a hands-on activity for students. Including a third sediment (craft sand) is important for students to really see how size affects the transport of sediments into ocean basins. The paint trays have a built in continental margin. Point out to students that the first slope in the tray represents the continental slope and the flat part of the tray represents the deep ocean. Ask them to predict what the pattern of sediments will be. Consider doing the activity as a demonstration, and use it to kick off the activity, as a means to show how sediments are normally deposited into coastal waters. Suggestions for how to use Student Notebooks for Lab 4.